EOLNET s.r.l. operates in Lipari since 2002. Its purpose is to provide advanced services on the use of Internet to tourism and productive enterprises of the Aeolian Islands and provide to the tourists who get to these magnificent lands the help they need to find all the useful information to spend in the best conditions a deserved rest and relax in the Aeolian archipelago. 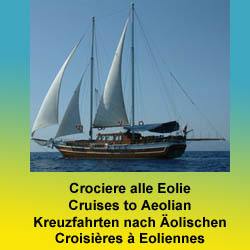 In our website and in those linked to it can be found all the information regarding not only the best offers, about where to sleep or where to eat the typical dishes but also about how to reach the island by plane, by train, by ship, by bus, by ferry, helicopter or seaplane, the tours and itineraries to follow, the boats to take to go visit the most beautiful places or bathe in the clear waters of the 7 “pearls” of the Mediterranean Sea . The information that can be found on Eolnet is also enriched with pictures that use the latest technology to illustrate the landscape and monuments. The most picturesque places and monuments of the Aeolian islands can be visited as if you were actually inside them. Pictures at 360 degrees and in high resolution, flights and virtual visits show you the beauty of the islands even before you decide to get to, to know them for true. A series of webcam allow you to view real-time what’s happening at the port of Lipari and on the craters of Vulcano and Stromboli and a page with the most detailed weather information for Italy and Sicily is available. In this website http://www.isoleolie.org, born from a project between Eolnet, Telespazio and the European Space Agency, can be admired in a specific way the characteristics of each island and just a few clicks are necessary inhttp://www.Eoliebooking.com to book the best services for the organization of any holiday period. Can be booked and purchased: tickets for transfers from and to the airport, weeks of vacation in hotel, B & B stays, Houses; You can book a table at the restaurant or choose excursions by boat or trips by bus to visit the most characteristic places of each island. Eolnet’s purpose is to offer the best services and ensure that who gets to these Islands remain such satisfied to wish to come back. Our customers only need to relax, for the rest, they can rely on us.